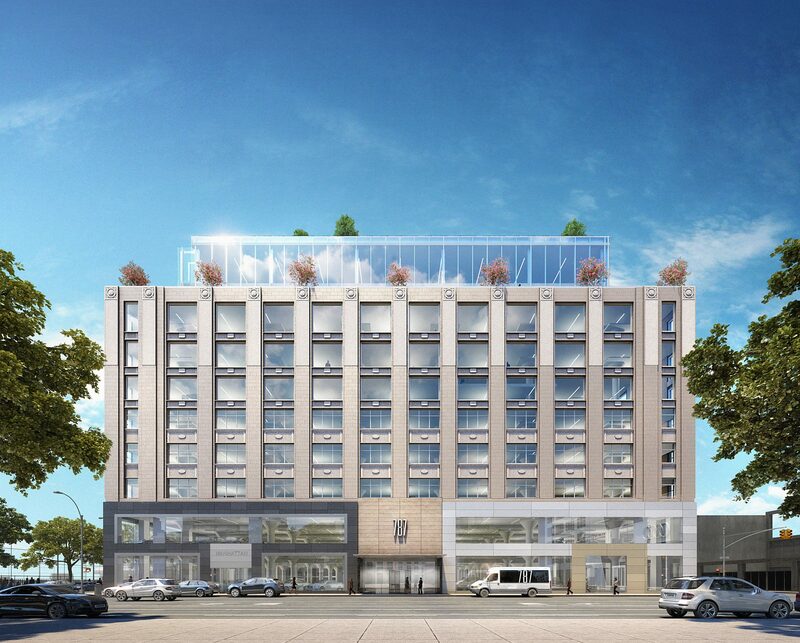 The Georgetown Company announced $410 million in financing for 787 Eleventh Avenue, the newly transformed building on the Far West Side. The recently completed redevelopment of 787 Eleventh Avenue includes a new two-story penthouse on the building’s top floors, floor-to-ceiling windows , exposed brick and large columns that pay tribute to the building’s original architecture, 24-foot high ceilings and a 12,000 s/f rooftop deck with a private terrace and tennis court. Architect Rafael Viñoly led the redesign of the building in the transforming Dewitt-Clinton neighborhood. Investors in the project include Arnold Schwarzenegger, LeBron James and Jimmy Iovine. Georgetown selected multinational investment bank Societe Generale (SocGen) to provide the loan after receiving significant interest from several large banks. A team led by Wayne Potters and Tim Hallock represented SocGen while Russ Schildkraut, principal at Ackman Ziff, helped Georgetown secure the financing. The loan replaces a $350 million construction loan from the Blackstone Group, Goldman Sachs and ICBC. Following a recently-signed lease for nearly 100,000 s/f on the 6th and 7th floors by co-working company Spaces, 787 11th Avenue is now approximately 90 percent leased. Spaces joins existing tenant Dwight Capital and Pershing Square Capital, whose space is nearing completion, at 787 11th Avenue. The building’s lower floors are occupied by Jaguar Land Rover and Nissan/Infiniti dealerships. Mary Ann Tighe, Evan Haskell, Arkady Smolyansky, Ben Joseph and Ross Zimbalist of CBRE are leading the leasing effort for the renovated property.